Our company is specialized in providing a huge assortment of C Frame Hydraulic Press for Various Application. 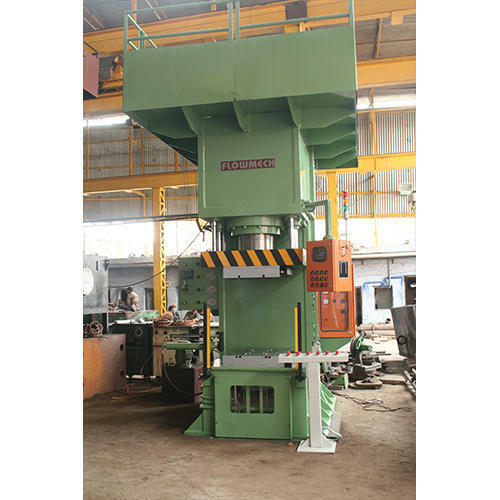 This Hydraulic Press for Various Application is highly demanded in the market for its sturdy construction. Since 1987 pioneer in the filed of hydraulics, Flowmech Automation Pvt. Ltd. develops and manufactures all types of Hydraulic Presses like Hydraulic Deep Draw pressses, Hydraulic Coining Press, Hydraulic Forging Press, Hydraulic Moulding Press etc. At Flowmech, quality is our prime concern. Our each and every machine is deliberately checked and tested and finally subjected to rigorous quality control measures to assure that only the best product reaches our customers. Our products are well known for their outstanding performance in accordance with the latest standards. Along with this, our company has successfully optimized the policies to evolve our group of experts in the filed of hydraulic into a highly integrated one. Our company, Flowmech Engineers has manufactured a very qualitative product known as Flowmech Press which is considered to be reliable companion and has its own reputation in the market. After designing and finalization of designs, varied parts are taken into manufacturing process to assure for the quality, measurement and functioning of the product. Different quality check ups are applied at each stage during the process of production and finally inspected by director. Our company accepts material only if it is under tolerance, otherwise it is replaced with new one. For providing satisfaction to our valuable precious clients, our company has manufactured electrical and hydraulic components and other accessories which are furnished under the quality test certificate. Also, we render quality assurance, inspection report test report to the clients. Flowmech Engineers are the reputed manufacturers of hydraulic press and a variety of hydraulic machines in India. The company has so far designed and developed hydraulic press mainly for the application in rubber, metal, clutch facing and brake lining sector.